My wife, Poonam, and I were fortunate to spend five weeks in Masai Mara during the annual Wildebeest migration this year. We were there last year for two weeks and came back convinced that two weeks were not enough. It took us a year to plan a five-week trip for five groups of photographers and wildlife enthusiasts, for a week each. The two of us have been making a living out of wildlife tourism for over 14 years and operate a small lodge (The Ranthambhore Bagh) in the outskirts of the Ranthambhore national park in India. This blog is all about the fun we had, the wildlife that we saw and the pictures that we got. Lenses: Nikon 600 mm f4.0, Nikon 200-400 mm f4.0, Nikon 70-200 mm f2.8, Nikon 24-70 mm f2.8, Nikon 17-35mm f 2.8. Cameras: Two Nikon D 700 and one Nikon D300. During the first week we stayed at the Olarro campsite in the Mara Triangle on the banks of the Mara River in a camp, specially set up for our company the Bagh Safari. Mara Triangle is a privately run part of Masai Mara and is not as crowded as the Narok side, across the river. The grass was still green when we reached Mara and the big herds of Wildebeests had still not migrated from Tanzania but all that was about to change. 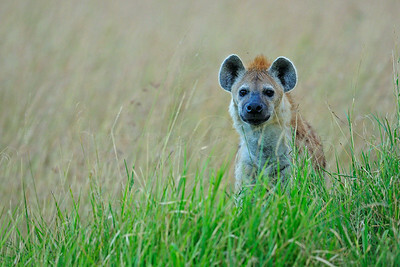 Spotted or laughing hyena that live in large matriarchal communities called clans. The camp was a basic bush camp but the campsite has an awesome location and that is just what we wanted. In other words we were camping in the heart of the action. Most visitors to Mara end up staying in fancy lodges or camps that are located far away from the action spots. As a result they end up commuting for an hour or more when the light is at its best, during the early mornings and late evenings. That does not work for us and fortunately we have friends who feel the same. We were in Mara for the safaris and not for the resort. Cheetah family and African tusker – the fastest and the largest mammals on land. 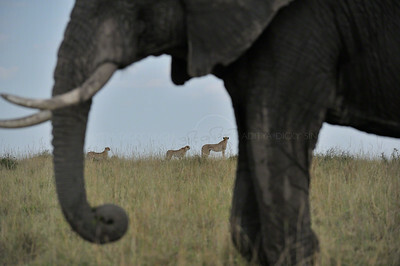 Three Cheetahs – a mother and two nearly full-grown cubs in the grasslands of Mara. Cheetahs prefer to hunt smaller prey, though a group of adult males working together can and will take down adult Wildebeests. 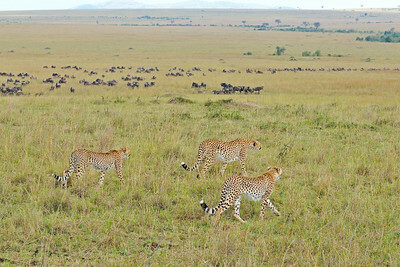 The first few days we concentrated on the cats as the big herds of Wildebeests were still across the border in Tanzania. We were richly rewarded with some great sightings of lions and cheetahs (my favorite cats). We did see a leopard but could not get decent pictures. 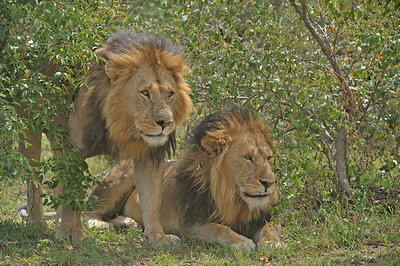 A pair of male lions – the second biggest “big cat” in the world. 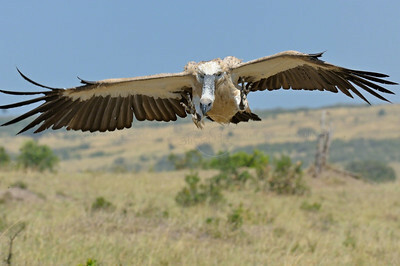 Mara has a thriving population of vultures like this White-backed vulture that was landing on a Zebra carcass. A few days after we reached Mara the migration was in full swing. 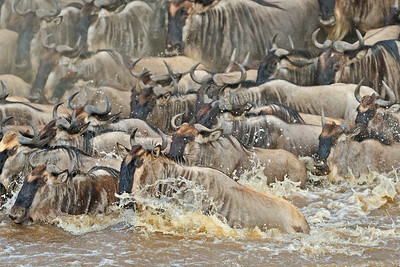 Large numbers of Wildebeests started crossing the border to enter the Masai Mara. This sight can blow your mind away. 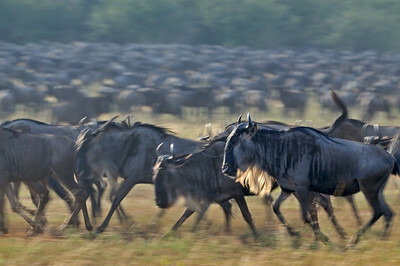 Massive numbers of wildebeests marching or running in a single line that can sometimes extend till the eye can see. Their safety lies in their large numbers and throughout the year they keep moving all across the vast plains in search of grass. The annual Wildebeest migration – the dust, the noise, the motion and the adrenaline. They move in a long single file till they find new pastures and there they start gathering. Within a few days a number of herds may gather together till their numbers are sometimes over a hundred thousand or even more. 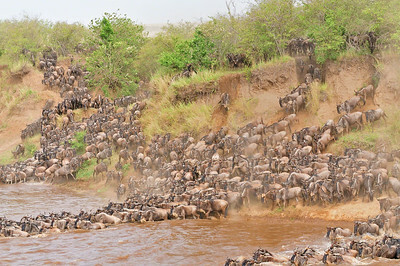 It is estimated that during the annual migration more than a million Wildebeests cross over from Tanzania to the Masai Mara. The numbers are mind-boggling. Five days after we reached the Mara we saw our first river crossing and boy did they cross. Crossing the Mara River – This event can chew up your digital storage. This is the event that I had gone for – one of the most spectacular wildlife events in the world. The action that one can see during a river crossing just cannot be put down in words and I will not even try to do that. All I can say is that when a river crossing starts my blood pressure shoots through the roof. As a wildlife photographer, you have not arrived till you shoot your first river crossing. During the next two days we saw a number of river crossings that left us totally exhausted. Before we knew it our first week was over and it was time for our eleven friends to leave. Poonam and I were staying on – after all we had four more weeks to go. This tusker near the Talek river gave them a fitting farewell. bhaiya, the photographs are aammmmmmmmmaazzzziinnggggg. The pictures are just divine…. 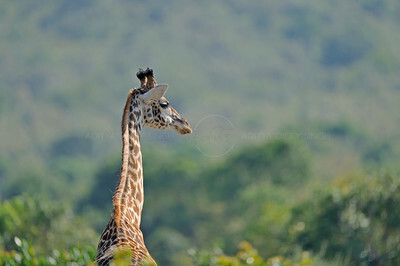 wish to join u in your next Bagh Safari Camp at Mara..
Beautiful. 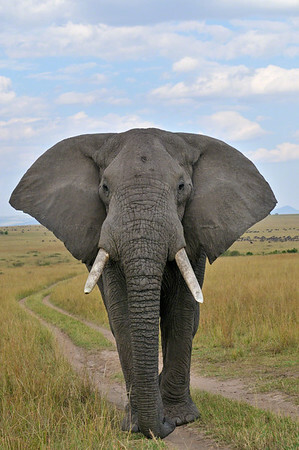 I lived in Kenya for 2 years but did not manage to spend more then 2 days in the Mara during the Migration. Keepup the good work Dickybhaiya.. Impressive photography with an absorbing writeup..
Hi Aditya, I am a friend of Priyanshu and have heard a lot about your adventures and misadventures. Lovely blog you have got here. Subscribed. Hope to meet you sometime.